gastrojejunocolic and gastrocolic fistula, alkaline gastritis, postvagotomy diarrhea, chronic gastroparesis. Recurrent ulcers form in about 10% of duodenal ulcer patients treated by pyloroplasty. These figures were accumulated before the emergence of effective treatment against H pylori, however, and are likely to be lower with current management. Recurrent ulcers nearly always develop immediately adjacent to the anastomosis on the intestinal side. The usual complaint is upper abdominal pain, which is often aggravated by eating and improved by antacids. In some patients, the pain is felt more to the left in the epigastrium, and left axillary or shoulder pain is occasionally reported. About a third of patients with stomal ulcer will experience major gastrointestinal hemorrhage. Free perforation is less common (5%). Diagnosis and treatment are essentially the same as for the original ulcer. A deeply eroding ulcer may occasionally produce a fistula between the stomach and colon. Most examples have resulted from recurrent peptic ulcer after an operation that included a gastrojejunal anastomosis. Severe diarrhea and weight loss are the presenting symptoms in over 90% of cases. Abdominal pain typical of recurrent peptic ulcer often precedes the onset of the diarrhea. Bowel movements number 8–12 or more a day; they are watery and often contain particles of undigested food. The degree of malnutrition ranges from mild to very severe. Laboratory studies reveal low serum proteins and manifestations of fluid and electrolyte depletion. Appropriate tests may reflect deficiencies in water-soluble vitamins. An upper gastrointestinal series reveals the marginal ulcer in 50% of patients and the fistula in only 15%. Barium enema unfailingly demonstrates the fistulous tract. Initial treatment should replenish fluid and electrolyte deficits. The involved colon and ulcerated gastrojejunal segment should be excised and colonic continuity reestablished. Vagotomy, partial gastrectomy, or both are required to treat the ulcer diathesis and prevent another recurrent ulcer. Results are excellent in benign disease. In general, the outlook for patients with a malignant fistula is poor. Symptoms of the dumping syndrome are noted to some extent by most patients who have an operation that impairs the ability of the stomach to regulate its rate of emptying. Within several months, however, dumping is a clinical problem in only 1% of patients. Symptoms fall into two categories: cardiovascular and gastrointestinal. Shortly after eating, the patient may experience palpitations, weakness, sweating, dyspnea, flushing, nausea, abdominal cramps, belching, vomiting, diarrhea, and, rarely, syncope. The degree of severity varies widely, and not all symptoms are reported by all patients. In severe cases, the patient must lie down for 30–40 minutes until the discomfort passes. Diet to reduce jejunal osmolality is successful in all but a few cases. Sugars and carbohydrates are least well tolerated; some patients are especially sensitive to milk. Meals should be taken dry, with fluids restricted to between meals. This dietary regimen ordinarily suffices, but anticholinergic drugs may be of help in some patients; others have reported improvement with supplemental pectin in the diet, the use of somatostatin analogues offers some promise. Reflux of duodenal juices into the stomach is an invariable and usually innocuous situation after operations that interfere with pyloric function, but in some patients, it may cause marked gastritis. 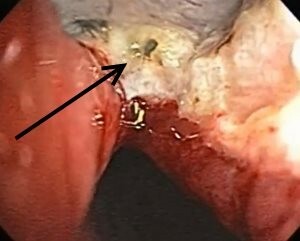 The principal symptom is postprandial pain, and the diagnosis rests on endoscopic and biopsy demonstration of an edematous inflamed gastric mucosa. Since a minor degree of gastritis is found in most patients after Billroth II gastrectomy, the endoscopic findings are to some degree nonspecific. Persistent severe pain is an indication for surgical reconstruction. Roux-en-Y gastrojejunostomy is the treatment of choice. Iron deficiency anemia develops in about 30% of patients within 5 years after partial gastrectomy. It is caused by failure to absorb food iron bound in an organic molecule. Before this diagnosis is accepted, the patient should be checked for blood loss, marginal ulcer, or an unsuspected tumor. Inorganic iron—ferrous sulfate or ferrous gluconate—is indicated for treatment and is absorbed normally after gastrectomy. Vitamin B12 deficiency and megaloblastic anemia appear in a few cases after gastrectomy. About 5% of patients who have had truncal vagotomy require treatment with antidiarrheal agents at some time, and perhaps 1% are seriously troubled by this complication. The diarrhea may be episodic, in which case the onset is unpredictable after symptom-free intervals of weeks to months. An attack may consist of only one or two watery movements or, in severe cases, may last for a few days. Other patients may continually produce 3–5 loose stools per day. Most cases of postvagotomy diarrhea can be treated satisfactorily with constipating agents. Chronic delayed gastric emptying is seen occasionally after gastric surgery. Prokinetic agents (eg, metoclopramide) are often helpful, but some cases are refractory to any therapy except a completion gastrectomy and Roux-en-Y esophagojejunostomy (ie, total gastrectomy).